This is the fourth blog in the "Take the Lead: Tech Neck to Perfect Posture" series focusing on engaging and challenging doctors around the world to Take the Lead in their communities to begin changing people’s lives by integrating cervical curve remodeling and posture correction into their existing treatment protocols. The majority of patients that walk through the office doors have some degree of forward head posture (FHP) leading to common cervicogenic conditions: migraines, headaches, neck pain, TMJ disorders, upper back pain, shoulder pain, carpal tunnel, arm/hand pain and numbness. This makes them fitting candidates for iTrac® Therapy, in combination with their treatments, based on their posture alone by a simple posture analysis. Forward head posture (FHP) is often accompanied by an abnormal cervical curve. Abnormal cervical curve (hypolordosis or kyphosis) is another reason to add iTrac® Therapy to the patients’ treatment plan. The iTrac® is not designed to replace clinic treatment protocol, but should be used as additional therapy to maximize the benefit to the patient. 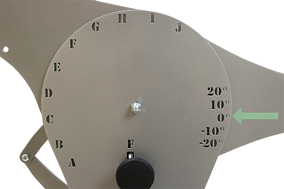 iTrac® Therapy offers 60 interchangeable settings to make the treatments more unique to each individual patient. The passive therapy of iTrac® Therapy is designed to restore the cervical curve and decrease FHP. 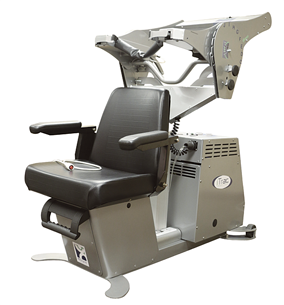 Maximized therapeutic outcomes are gained when combining iTrac® Therapy with traditional manipulation protocol, mobilization, massage, and/or muscle strengthening. This allows for a diverse treatment while being able to treat the chronic, posture related cervicogenic conditions for each individual case. The state of the art design and user-friendly software allows clinicians to create unique treatment plans to each individual, while being administered by a clinical assistant. This design allows clinics to maximize patient volume and revenue without requiring extra time from the doctor. Without the need of extensive training, very little time is needed to integrate iTrac® Therapy into the clinicians’ treatment protocol. By using this unique therapy, the clinician offers an innovative, yet simple and affordable passive therapy to a patient’s treatment plan. Up to eight iTrac® systems can be run simultaneously via one iTrac® computer for high volume clinics. Patients want to feel better, and they want to feel better fast and for many years to come. Clinicians are now able to combine structural therapy and functional therapy with minimal changes to clinicians’ treatment protocol. Utilizing the effectiveness and comfort of iTrac® Therapy for “structural” correction of abnormal neck curve and FHP, the effectiveness of the “functional” therapies currently administered by the clinician will be maximized. By combining structural therapies and functional therapies, clinicians are now able to consistently, effectively, and confidently offer long term resolutions to patients for their cervicogenic conditions. iTrac® requires no change in external marketing to attract a new patient demographic because the patients who need it already exist within the practice's patient base. By incorporating iTrac® Therapy into the treatment protocol, the clinician can expect improved healing, long-lasting symptomatic relief and significant improvements in the quality of life for their patients. Teresa Burnett, DC was born and raised in western Kansas. Upon graduating from Kansas State University with a Bachelor of Science degree in Kinesiology she received her Doctor of Chiropractic degree from Parker University. 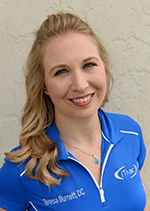 Post-graduation, Teresa and her husband, Brooks, moved to Manhattan, KS, where she currently works as the therapy coordinator for Nichols Chiropractic.